China Ocean Engineering integrates new research concepts, equipment, technology, materials and structures and other scientific advances within the field of estuarial, coastal, offshore, and deep water engineering with particular reference to developments. The Journal is concerned with all engineering aspects involved in the exploration and utilization of ocean resources. Topics regularly covered include research, design and construction of structures (including wharfs, dikes, breakwaters, platforms, mooring systems, etc. ), instrumentation/testing (physical model and numerical model), wave dynamics, sedimentation, structural/stress analysis, soil mechanics, and material research. 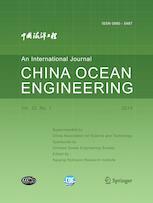 China Ocean Engineering is a publication of Chinese Ocean Engineering Society.